Search around the forums and you will find answers to all of your questions. Check out the work progress thread for current update information. Would it be too much to model being sucked into a black hole? Something I have thought about a lot, in general, in relation to space engine since discovering it, and which seems to keep coming up in this thread, is the modelling of all things not just landscape as realistically as possible. I understand this to be an ideal goal but also that implentation is likely to be difficult and take a long time (although Space Engineer seems to have accomplished many seemingly impossible feats already!) but maybe someone (I'm expecting Space Engineer or HarbingerDawn) could enlighten me... with the weather, is this constant or variable with time? So of course visit the same planet the same second of the same year etc the positioning is the same / all external influences but will the clouds and therefore precipitation be the same? Also related to this; 'sea' levels rising and falling. Is it possible that this, like the landscape, could be encoded into the procedural algorithms so that anyone visiting the same part of the same planet at the same time would see the same weather or would this be 'back-simulated' as it were (perhaps not feasible and I don't know where it would 'begin' or simply randomized? How is the weather in it's simple current state decided? Would it matter if two people visited the same place on the same planet at the same time and saw very different weathers? Perhaps not if playing totally solo, although one may like to revisit that place and see the same thing, but would it be possible to have a server to do the calculations and keep a record? So that even in solo mode, the same place and time would see the same dynamic? Is this something needing consideration do you think? Sorry to go on, I hope you'll understand my question, and please, if you think it better suited to another thread, put it there. Is it possible that this, like the landscape, could be encoded into the procedural algorithms so that anyone visiting the same part of the same planet at the same time would see the same weather or would this be 'back-simulated' as it were (perhaps not feasible and I don't know where it would 'begin' or simply randomized? Speaking of procedural generation, it WILL generate the same result for the same time and the same place. But with generation, it is very difficult to obtain realistic-looking results. For example, the flow noise is cool algorithm to simulate cloud layer dynamics, but it is a simulation - it must be performed step by step starting from some procedurally generated pattern. It is impossible to use it in SE, because for example if flow noise simulation staring in 2000, and you visit the planet in 2010, you must perform 10 years of simulation. And if you visit that planet in 1990, it just will not work. This was what I thought, so then will weather patterns still be simulated, based on the characteristics of the planet but will begin from a random seed within the probabilities that might exist on that planet at that time then? But there will still be simulation if you actually play it through from that point (which would be incredible still)? Or will it likely be more that the weather does a bunch of stuff not outside of likelihood but is not inherently following on from the systems previous states in a particularly realistic manner? It's just.. I've noticed every now and again, when cycling through time and looking at water, that at some point (perhaps when the temperature passes a threshold?) the water just seems to vanish, so I'm wondering in the case of the latter, would there be such 'jumps'? Am I observing something incorrectly with that? Great job, great Space Engine author, thank you for the hearts of the people have been eager to achieve that dream universe, but also thanks to Space Engine production team has been on the Space Engine efforts and support, where I, on behalf of the Space Engine players say to you, thank you for your selfless dedication; you have worked hard! because for example if flow noise simulation staring in 2000, and you visit the planet in 2010, you must perform 10 years of simulation. And if you visit that planet in 1990, it just will not work. I disagree. unlike other objects in SE clouds should not be persistent and constantly change paterns and disappear just like here on Earth. all you need to do is simulate the clouds when they become visiable to the observer when close enough to the planet. if I decide to revisit the same world a few moments later it will generate a brand new pattern. In many ways this would be great, for individual players as you could get some really realistic simulation. However, what about if in a shared universe? Like where multiple people may visit and share the same planet at the same time? I suppose how this will work depends on how the multiplayer aspect will work. It's just that it's really nice to be able to save a location in space and time and then return to it, knowing that it will be the way it was when you looked there last time. Perhaps it could be that the general manner of the weather is generated by the algorithms but then the actual fine details may vary as they are simulated in real time, like the cloud formations? But the general idea is set, e.g. very overcast, patchy clouds, fog, clear, precipitation based on temp and other factors or a combination of these in various layers. This way, you would be able to be pretty much assured that the scene you left will look pretty much the same when you return, but the fine details will vary, e.g. specific cloud configurations will be lost but this would be a reasonable price to pay to be able to see actual realistic looking moving clouds. With precipitation, the type would be procedural I assume (based on temp / pressure etc) but in the case of 'patchy' precipitation whether or not your exact location is being precipitated on right now, would be down to probability, based in the 'on-the-fly' particle / particle body simulation of the portion of atmosphere which is being viewed. Is this feasible? At this issue I think it would be surely amazing! I've recently discovered that Sulfur lava glows in a deep blue like in these images (1 2).It would be great if SpaceEngine could render such different colored lavas. 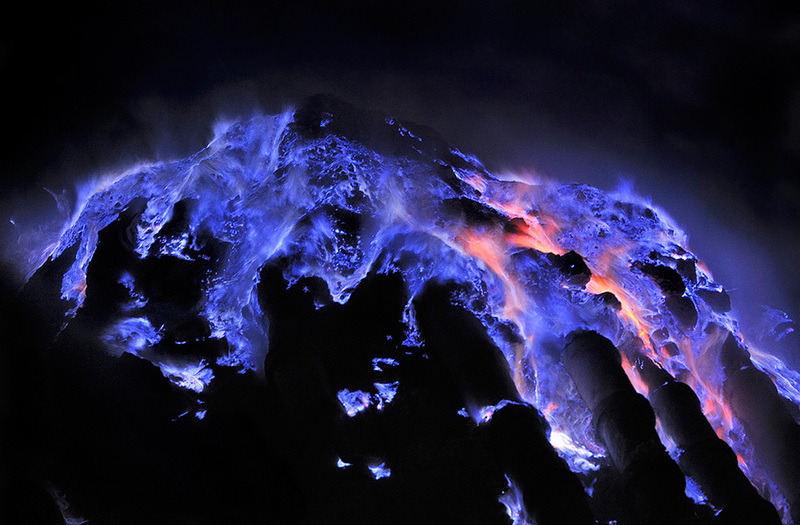 It will blow my mind to see the night side of a planet glowing with blue lava and blue eruptions of sulfur. I was thinking of the possibility of other colors for lava, dependent of the chemical composition (maybe purple lava or green lava in some worlds). Sulfur lava appear in very strage situations here on Earth, but maybe there are places where Sulfur rich volcanoes are common. I read that in Io there is this condition (I only saw pictures of yellow-orange lava in this moon but maybe there are some places where we can find this blue lava or mixes of it with other silicate lava rivers). What do you think SpaceEngineer? Will these weather changes be procedural? So that if, for instance, you want to see rain, and you find rain, then if you go back to that time at that location, it will always rain, assuming none of the algorithms are modified by the user. This is must be procedural, otherwise it will be impossible to share locations with another users. But this fact is a most difficult. There are many good algorithms of simulating weather, like flow noise for cloud pattern, but they are not procedural. This mean what it is impossible to go back in time and see the same pattern. And further more, even the best flighting simulators that I know of do not share the exact same pattern between clients when in online mode. Only the weather type is shared (the only case that caused problem with the pattern itself to me was when I was flying with friends with gliders on FSX with a "for-glider" augmented weather, because clouds were not the same for everyone we couldn't all fly using the same trajectories). In the online game time travels will be impossible. This is makes situation much more easy. Clients may synchronize their weather patterns with each other when new client enters the same planetary system.